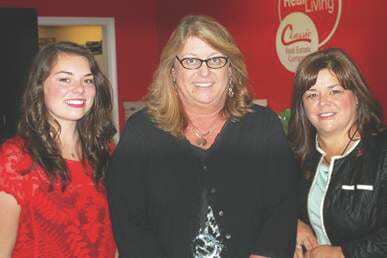 Rhonda Kidder (center), named the 2015 recipient of the Joyce E. Fender Memorial Scholarship, is shown with Joyce’s daughter, Jenny Hilterbran (right), and granddaughter, Savannah Cameron (left). Southern State Community College has announced the recipient of the Joyce E. Fender Memorial Scholarship for 2015. The SSCC Foundation presented the award to Rhonda Kidder of Hillsboro. Kidder is a student at Southern State working toward an associate degree in technical studies. She plans to take her Ohio Real Estate Salespersons Exam following graduation in spring 2016, then join Classic Real Estate Company, which has agreed to sponsor her as a realtor. Kidder will also continue in her current career with the housing department of the Highland County Community Action Organization Inc. The family of Joyce Fender established the scholarship fund to honor her memory by providing financial assistance to a student pursuing a business major, preferably in real estate. The candidate must also be a single mother and exhibit a need for financial assistance. After Kidder applied for the scholarship, she learned that she had breast cancer, the same disease that afflicted the scholarship’s namesake. Kidder didn’t know if she could accept the award because she has had to put schooling on hold while going through treatment. Kidder said that Joyce Fender’s daughter, Jenny Hilterbran, assured her the funds would wait until she was ready to resume her coursework. To learn more about SSCC Foundation scholarship opportunities, visit www.sscc.edu/financialaid/scholarships.shtml. For information on the stewardship role of the SSCC Foundation, visit www.sscc.edu/about/foundation.shtml.